In the Bastion corpnation in the southern plains of Mars, beside Lake Hellas. A tourist visiting Sholoban should hit the town toward the end of the summer and try to make the exclusive Doomtown Film Festival. Even if you can’t get into the event, you can catch the films from nearby rooftops, and the party spreads for a half mile. The local economy broke down centuries ago. Cred chits are always welcome, but a bag filled with candy bars, better booze, prophylactics, patch kits, and other cheap tradeables, along with a lot of confidence and maybe a camera, will open all kinds of doors. Warning: the neighboring corptowns are best avoided, disappearances are high and there’s no friendly IRPF officer to help find a missing person. When it was first planned out, Shobolan was the inexpensive residential zone for Bastion’s rank-and-file employee citizens. The money was in the sweeping, tall buildings that rose up on every side. 500 years later, if there ever was truly any money in the city it’s gone, but Shobolan has a robust community of squatters, philosophers, semi-feral laterals, malcontent twenty-year-olds, and the actually destitute. Uptown and Oldtown share some commonalities. When they were built, both were created as vast residential zones, with modest habitation blocks edging toward a half-kilometer high taking up most of the land. Some have crumbled, particularly in Oldtown. Some have been upgraded and rebuilt over the years, particularly in Uptown. Both sections were made with an abundance of blue-tinted stonework, glass, and high-wear plastic, and that turns up in the original buildings and salvaged wrecks. Shobolan’s not a paradise, but it’s not the worst place to go to ground. 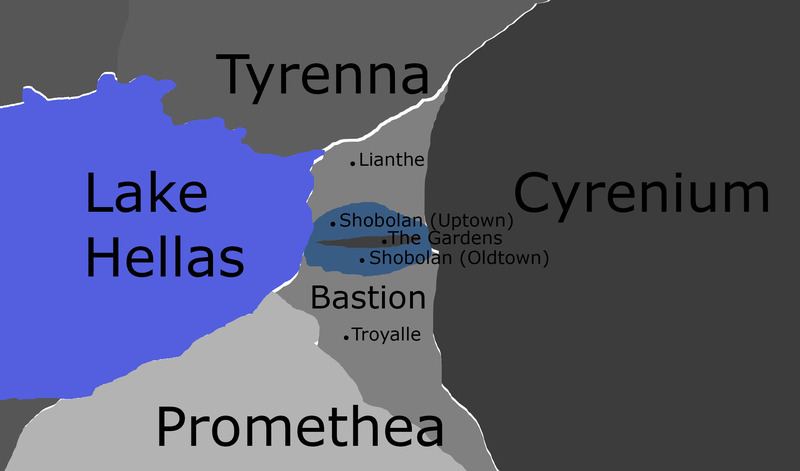 The arching walls and towers of Troyalle and Lianthe block most of the harsh winds and capture some of the moderate weather from Lake Hellas. Uptown Shobolan may be a wreck, but nobody would ever call it abandoned or desolate. Some 20,000 or more squatters make Uptown their home, drawing power from Lianthe’s flickering grid, brewing their own simu-soy rations, and generally ecking out shadowy existence just on the edges of MarsCo and ASR’s radar. It’s lawless, but so is a huge part of Sol, and without the threat of hotzones and head-stomping IRPF goons, Uptown is safer than many parts of, say, Venus. It’s not entirely free of corporate influence. Pulse and Marsco’s media groups and Spyglass are both active in Shobolan, but they keep a low profile. In part, it’s due to their influence that MarsCo still provides services in Lianthe, even after centuries of returned mail. That, and turning the lights off takes more effort than leaving them on. A small cabal of Spyglass’s agents watch Shobolan from the towers of Lianthe near ASR’s territories. They’re interested in Shobolan as a laboratory for the off-market anarchy that’s Spyglass’s ideal, and might quietly intervene if any corporation throws too much weight around Bastion. They’re also aware that many of Uptown’s residents are there because they have something to hide, and no doubt will pay a generous sum for the service of remaining hidden. MarsCo/Pulse’s Titan Film Cooperative makes its home in a cluster of ivory towers overlooking the lake, and their offices are plastered with promotions for whatever cheesy action flicks they’ve made over the last few years. During the summer film season it’s a friendly and inviting place, usually screening shows, holding casting calls, and serving up the cheapest possible hot dogs, doughnuts, and “coffee” for natives and visitors. The original city had shorter residential towers than a Marsco development would have had, so there weren’t originally many skybridges linking the buildings together. The locals have taken care of that for themselves, and over the centuries have built rickety bridges, extended roofs, and connected buildings together, even adding layers to the tops of buildings that fit the local variety of crazy. None of it is up to any sort of code, some of the construction is a century or more old, nothing has signs or warning labels, and visitors that have soured their local relations or didn’t tip their guide may not survive their visit to Shobolan. Regarding the locals, it’s a mixed bag of young rebels, old exiles, folks who’ve run out of options, and an awful lot of laterals. Where Uptown runs against the Gardens, the population shifts, laterals making up nearly half the local population. Uptown and the Gardens make up kind of a “little Longbow,” but with less bloodshed and more cheap local beer. Felidae, Avialae, and bats are the biggest groups in the local lateral population bloom, but it’s a common place for jaded laterals to break from the world and live a “feral” existence…even one with access to heat, booze, and the latest action flicks. Where Shobolan proper was originally decorated with shades of blue, The Gardens were built out of basalt, dull and black. They were created as a way to lighten the endless sprawl of the residential buildings, a 180 mile greenbelt cutting through the corptown. Bastion commissioned outdoor art, exotic basalt buildings, ponds and rivers, and a hundred other ways to make this little swath of green welcoming and distracting. In places it’s exotic and strange, modelled after ancient Terran documentaries. Sometimes it’s elegant and “modern,” at least as modern as 500-year-old statuary can be. The vegetation originally planted in the garden was tweaked for hard winters and poor light, and much of it survived and thrived. Uptown is vineridden, and a lot of its 15th floor construction is woven from these still-living tendrils. The garden is huge, over 800 square miles of strange structures, massive trees, and the occasional ancient tourist trap. In the summer it’s peppered by villages and back-to-nature communes, with roving bands of laterals patrolling, panhandling, performing for the occasional tourist, and generally skiving. In the cold months the villages shut down and the villagers move indoors. It’s not remotely a paradise, but not a bad place to pass a few years, when times are good. About the only time the Gardens turns savage is the summer film season. When the casting calls go out, the locals turn out in droves to play in grade Z action thrillers and horror flicks. For Vectors with conventional builds, it’s a quick way to pick up some creds. For the Garden’s laterals, it’s a call to battle. There’s not a lot of parts out there for four-leggers, and long years have proven that the best parts go to the actors covered in the most blood. It’s a mostly friendly scrum, they avoid loss of life and limb, but may be the only gig some of the four-leggers see that year. But for the rare shot at a film with a major star, with the chance to play a main villain, a rare heroic part, or the exotic and dangerous love interest, those fights sometimes turn deadly. Overall, the Gardens are a weird mixture of camping grounds, jungle, outdoor sculpture garden, commune, homeless shelter, and scrapyard. Visitors are rarely in physical danger, but setting up a campsite too close to the wrong village or in the wrong lateral’s territory may get their equipment stolen for salvage. It may be worth a visit for the annual Black Friday parades. These wind through the city alleys and end up on the edge of a massive pit (the understructure of an industrial plant that was cancelled early in its construction), which may someday fill up with the wreckage of floats and puppets from years past. Residentials for a mile around were partially demolished, leaving a gap like a pulled tooth in the cityscape. Wayfinder does not recommend staying long in Oldtown. Travellers with delicate constitutions or respiratory conditions may not respond well to the industrial pollutants in the dust and soil of Oldtown, and disappearances and accidents are higher there than in the rest of Bastion. If a tourist encounters some life-threatening difficulty, the chance of any friendly response to a cry for help is damned low. Oldtown is not safe at night. Besides being mildly toxic, a trio of exonymphs has found its way here. Their reputation may suggest otherwise, but the ‘nymphs are not murder-machines hellbent on eating the good citizens of the region. They are, however, quite protective of their secrecy. Really, in this vast wreck, there’s no shortage of monsters.The nymphs have a much bigger threat to deal with than the occasional Vector: the colony of Palemen at their southern border. Much more able to handle the trace toxins of the city, the Palemen have been successful in establishing themselves in the ruins of Troyalle and have been scouting Bastion as well. Their real goal is simply to survive, and to protect their sister race, the Selkies, who have made their homes in Lake Hellas. The land is big enough that the two groups of predators can usually avoid each other, but Vectors who stumble across their machinations rarely survive the experience. ♃ Going Native: There’s a call in the jungle that only laterals hear. Or maybe it’s just the lure of being treated as an equal, or finding the place they can belong. It’s a powerful draw that calls some of these animal-shaped Vectors to Longbow, but Sholoban’s closer, safer, and it’s not such a commitment. Many laterals make their summer home in the gardens of Sholoban, playing the part of the savage native for a month or two before returning to their jobs. This might be a fun way to have a back-to-nature plot for the lateral in your game without the moral horror of Longbow.